The International Leadership conference series, a flagship project of the Universal Peace Federation, serves a convener of leading stakeholders from throughout the world who are committed to a search for realistic and pragmatic solutions to critical global problems. Drawing on the assets and expertise of people from all sectors – government, civil society, faith-based organizations, academia, the private sector, etc. – the ILC represents a collaborative approach to peace. As an NGO in special consultative status with the Economic and Social Council of the United Nations, the UPF has an established presence on every continent. It is building a wide network of individuals and organizations who seek to work together by going beyond divisions of nationality, ethnciciy, race, religion an even political ideology, underscoring the common humanity of all people and living in one world, our common home. The critical challenges the ILC participants are addressing include the devastating impact of climate change; the rise of extremist ideologies, both religious and political; the ongoing problem of extreme poverty; and the essential importance of good governance, not only for governments, but for all sectors of society, including the non-governmental sector, the faith-based sector, and the education sector. Earlier this year, UPF launched the International Association of Parliamentarians for Peace, building on the foundation of work with parliamentarians over the past decade. The launch of the IAPP represents an effort to provide an informal network of parliamentarians who can work together collaboratively for the sake of peace and human development. The 2016 ILC series has included the regional-level launch of the IAPP in venues around the world, including Nepal, Burkina Faso, the United Kingdom, Costa Rica, Paraguay, Zambia, Japan, and concluding in the United States. Parliamentarians are uniquely qualified to serve as advocates for peace and human development. As representatives of the people, they stand as mediators between government and civil society. Their experiences with the practical challenges related to law-making and public policy give them a unique set of skills and insights that are required in building a world of lasting peace. IAPP will provide a forum for parliamentarians from all nations and political parties, allowing them to come together in a spirit of dialogue and cooperation to search for solutions to local, national, regional, and global problems. IAPP understands that there are many very important organizations and associations of parliamentarians around the world, some formally organized as intergovernmental bodies and others informally associated. IAPP intends to work in collegial, cooperative and supportive way with other parliamentary organizations wherever there is mutual interest and shared concern. The same spirit of support and cooperation applies to the mission and work of the United Nations, which IAPP affirms. - To encourage respectful and cooperative interreligious relations as essential to building a peaceful world. Parliamentarians are the representatives of the peoples of the world and, in that capacity, stand in a very special and important role in their nations and in the world. Given that we live in an interconnected world, and knowing that our problems are often global in nature, we are increasingly aware that global solutions to our world’s problem must be sought. We believe that IAPP will be a significant contributor to peace and human development for all of humanity. 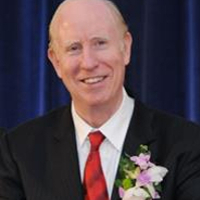 Dr. Walsh is the Chair of UPF International and Secretary General of the Sunhak Peace Prize Foundation. He has been a teacher, author, and editor specializing in the areas of interfaith, religious studies, peace studies, philosophy, and social theory. Dr. Walsh serves on the International Council of the World Association of Non-Governmental Organizations and the International Coalition for Religious Freedom. He has contributed to and edited more than 30 books related to interfaith, peacebuilding and renewal of the United Nations. This article was published in a Special Report by the Washington Times (Nov. 30) on the Washington DC International Leadership Conference (ILC), in which Dr Walsh explains more in depth about the purpose and objectives of the International Association of Parliamentarians for Peace (IAPP).